One should consider three types of criteria in choosing a biocide: type of cooling system, water quality factors, and water discharge limitations and regulations. 1. The type of cooling system is important. Discharges from once-through systems are stringently regulated, given the volume of water discharged back into the receiving body of water. Thus, low levels of oxidant application are the usual choice. Open-recirculating and spray pond systems have limited discharge volumes. Thus, although oxidants are most commonly used, non-oxidizing biocides are used under some circumstances as described earlier. If discharged, some nonoxidizing biocides are toxic, and may require detoxification prior to discharge. 2. Water quality factors must be noted. An important consideration of water quality is the oxidant demand of the cooling water. 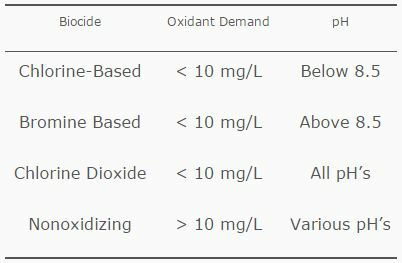 If the water has an oxidant demand of greater than 10 mg/L, then any oxidant may be cost-excessive, and non-oxidizing biocides should be considered. The pH content of the water also influences the choice of biocide. If the pH is above 8.5, then bromine or chlorine dioxide may be more effective than chlorine. The water quality criteria for choice of biocides are shown in the following table. 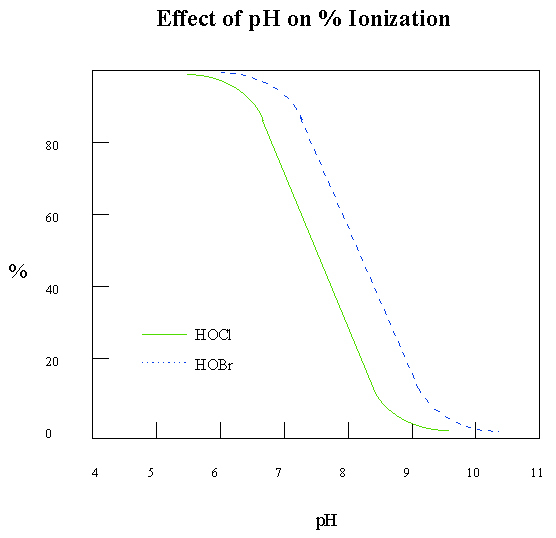 The graph below shows the effect of pH on ionization of chlorine and bromine. 3. Water discharge limitation and regulations are always a major factor in biocide selection. Regulatory agencies historically have favored chlorine or chlorine compounds over bromine or non-oxidizing biocides. However, each state or regional regulatory agency tends to have its own biases that must be considered. Each location must evaluate its own system type and water quality, as well as regulations, to make a choice that will be cost-effective in the long run.